Sometimes hurrying up is to our advantage in life – when we’re running to catch a train, when we’re faced with an important deadline, or when we’re joyfully accomplishing a personal challenge. However, hurrying, beyond a certain point, becomes self-destructive. As a constant way of being, it is not sustainable. It is a “yang” energy in our lives which must be balanced out by the “yin” of slowing down, if it is to be effective and valuable. It is a “doing” micro-energy that can only have meaning and value in the context of a “being” meta-energy. Clients are sometimes initially disappointed to learn this, because they arrive at the coaching process in a race to reach their goals, and are often impatient to move forward. But it is the wonderful yin meta-energy that gives their goals context; and to see this, they first must slow down and observe. In coaching, clients are sometimes (often) disappointed to learn that they must “slow down” in order to “speed up”. They arrive at coaching with a life dilemma they’ve been trying to solve for a while, or a project they are eager to put in place, and they are often “in a hurry” to get to the goal. For gifted people, this is commonly the life dilemma of “how do I choose just one path?” Whatever the dilemma and however longstanding it is, not rarely, it is actually clients’ “hurry” that is keeping them from resolving it. They’ve been hurrying themselves to get to the goal, stuck in “doingness”; as such, they have not been spending time in calm observation and “beingness,” and have been missing important details, or necessary awareness of meta-themes in their life, that they will have to understand and co-create with in order to get to the goal. 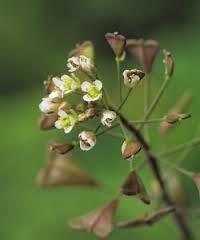 *The nazuna is this flower, called Shepherd’s Purse in English (see photo). With these few well-chosen words, Basho reminds us that when we are running quickly past our surroundings – as we do when we are hurrying – we miss details (we don’t see the tiny flower blooming at the side of the road). That’s okay sometimes, but there is also an immense and necessary pleasure in exploring the details of our surroundings, in seeing the flower bloom; and we simply cannot do that when we are rushing by in a hurry. Of course, there is another kind of necessary pleasure in rushing, but it serves a different purpose (when we’re running to catch a train, when we’re faced with an important deadline, or when we’re joyfully accomplishing a personal challenge). Both rushing and observing are pleasurable and necessary at certain times and in certain conditions, but neither kind of pleasure is sustainable on its own. They need each other: the yang (doing or rushing) needs the context of the yin (observing and being) to make sense, and vice versa. The yang energy – the doing energy – is good in short-term bursts. It is the micro-energy which allows us to take care of practical details, to tick off items on our to-do list, and to catch our train. The yin energy – the observing or being energy – is good in between these short-term bursts of yang energy. It is the macro-energy that takes the time to consider our surroundings (inner and outer), to notice where we are, and to verify if we actually want to be on the path that we are on. Yang energy alone turns us into robots; yin energy alone keeps us from accomplishing. Yang energy balanced with yin energy allows us to oscillate back and forth between bursts of doing and then periods of observing and being; with yang we get to experiment and do, with yin we get to experience and verify. For those clients who arrive to the coaching process in a panic to get to the goal today (gifted people are often known for their impatience in process! 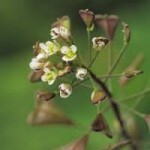 ), they are neither finding pleasure in the doing, nor pleasure in the observing. They are panicked while doing, and panicked while observing. Thus, they cannot “see the nazuna”, nor find pleasure in following their path. They’re often not even sure they’re on the right path! So how can we get out of the vicious circle? We can slow down and spend some yin time observing the crucial details of our lives, including our authentic passions and life path, as well as our values, personality preferences, and cognitive reality. Many gifted clients are still being guided (unconsciously) by the expectations of others (family, culture, etc). They haven’t taken the non-panicked, non-rushed time to fully evaluate what they want for themselves. They are still in reactive mode, trying to twist themselves and their “potential” to fit into a mold that was created for them long ago (by parents, society, culture, gender roles, etc). They are hurrying to do, but they don’t even know why they are doing what they are doing. All sorts of victimization and rebellious attitudes are born here. Clients want to know what they are “supposed to do” or who they are “supposed to be”, but when their parents, society or peers give them answers, they revert back to childish or adolescent strategies of avoidance, self-sabotage and self-destructive behaviors. In coaching, I call this the “authority problem”. Dabrowski referred to this as a “horizontal conflict”. Until one has become one’s own authority and guide, which requires knowing oneself rather well – one’s basic cognitive, emotional and behavioral reality – it is very hard to fully choose one’s own path. And until one chooses one’s own path, he remains, to some extent, the victim or the puppet of someone else’s choices. (See carried emotions for more in-depth insight on this concept). Yes, in theory, it is obvious. But we often unconsciously adopt these voices and make them our own. Despite our theoretical self-knowledge (that we like freelancing), we keep judging ourselves as “less than” when we socially compare ourselves with our peers who have “real jobs” (“real jobs are better”). Another example would be growing up in a culture that tells you men must be strong and directive, but you are a true empath and are highly sensitive. Do you find yourself believing that, despite your wishes, you must “overcome” your empathy and sensitivity to be considered socially “strong”? All of these questions point to the sorting out process that happens in coaching: What do you want for your life? What makes your life worth living? What do you believe about yourself, and humanity, and what makes you valuable? This brings up the question of values, and I often suggest an exercise for clients to do in order to better identify what their values are. We must know what we stand for, and what gives our life and actions meaning. Without values, our hurrying is not grounded in reality and loses meaning. It also brings up the question of personality preferences and structure. Are you more introverted than extroverted? More dominated by logic or feelings? When do you need to collaborate with others, and when are you better left alone to reflect or plan? How do you best communicate about feelings, planning, decisions, strategies, and preferences? Many people don’t really know the answers to these questions (after all, who would have taught you this in school? ); instead they just keep trying to be who they think they should be, and function how other people tell them (explicitly or implicitly) they should function. And finally, how does your brain work? What is your cognitive reality? How do you experience and process the world? Gifted people’s cognitive reality is quite different than the norm. It’s more complex and intense, and follows a different “process” than most. Knowing this, and having a measure of understanding about the way your cognitive process works, is extremely important, because it is hard to generate realistic expectations about how a “machine” is going to produce if you don’t understand how the “machine” works. Our brain may not exactly be a machine, but the analogy holds. Values, personality and cognitive reality form a sort of essential core that makes each of us “unique” and in some ways, quite predictable. It is this uniqueness and relative predictability that gives us our authentic direction in life, as well as a measure of control over the speed and quality with which we move toward that direction. In other words, our values determine our goals; and our personality and cognitive reality determine the quality and expression of the process that we go through while moving toward our goals. Once we understand this functioning, and know how to fine-tune it, we can go ever faster, and enjoy the speed. But how would you be aware of any of this, or be able to dig into these personal questions, if you didn’t have enough “yin” time to observe yourself? Hence the first stage in coaching – the “yin” – never the “yang”. This yin time is where we observe authentic values, enduring personality patterns, and unique cognitive functioning to learn to enjoy the self and feel confident about one’s direction; then, yang action bursts are introduced to make progress on the journey. And there is pleasure to be found in both states. It’s no longer a compulsive never-ending race toward an unclear goal. We know after a burst of meaningful doing, we will slow down our pace and start “looking at the nazunas” again; we will take the time to observe the sunset, our inner feelings, and all of the things which constitute our current inner and outer surroundings. Our observations will confirm our doing, or will show us where we might have strayed off-track; they will – once we’ve enjoyed the view long enough and are ready to continue the travel – allow us to reroute ourselves toward our most authentic and self-chosen destination, and to ultimately speed up our journey toward our goals. Throughout this article, I’ve provided links to dig into the processes presented, such as evaluating one’s values and preferences. Please feel free to explore these questions further, via these links and the many articles on our blog. I’ve also been liberal on my use of the concepts of yin and yang, please read it as such.